The Pak 43 (Panzerabwehrkanone 43) was a German 88 mm anti-tank gun developed by Krupp in competition with the Rheinmetall 8.8 cm Flak 41 anti-aircraft gun and used during the Second World War. The Pak 43 was the most powerful anti-tank gun of the Wehrmacht to see service in significant numbers, also serving in modified form as the 8.8 cm KwK 43 main gun on the Tiger II tank, and Elefant, Jagdpanther and Nashorn tank destroyers. The improved 8.8 cm round had a relatively flat trajectory out to 910 m (1,000 yd) and was able to frontally penetrate any Allied tank at long ranges. Even the Soviet IS-2 model 1943 tanks and IS chassis-based tank destroyers were vulnerable to the Pak 43. The Pak 43 had certain drawbacks as the increase in muzzle velocity was offset by the need to keep down the weight of the gun. The light tube resulted in a "considerably reduced safety factor". German gun crews were instructed not to use high-velocity ammunition when the tubes had fired 500 rounds. The gun's maximum firing range exceeded 13 kilometers (8 miles). 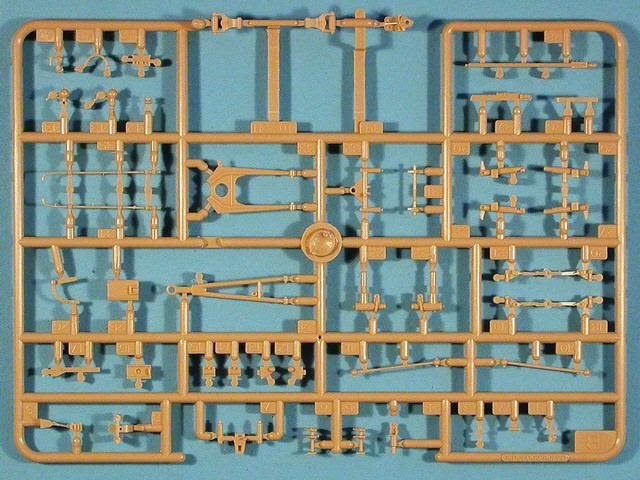 Trumpeter is a model company based in China. 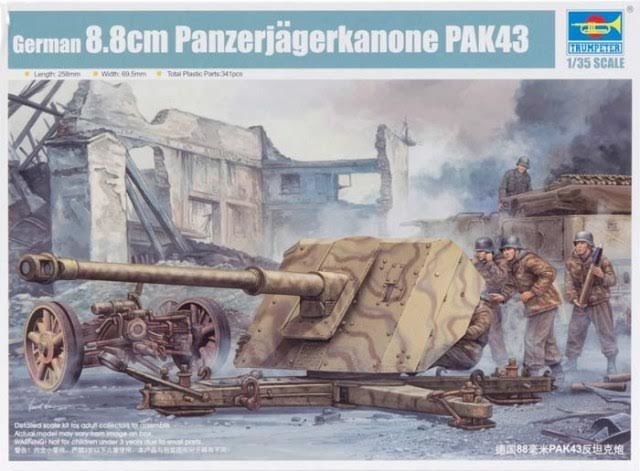 The box art shows a PAK43 set up in a town square surrounded with demolished buildings and with a 3 man crew. It is overall light tan with wave lines of green. 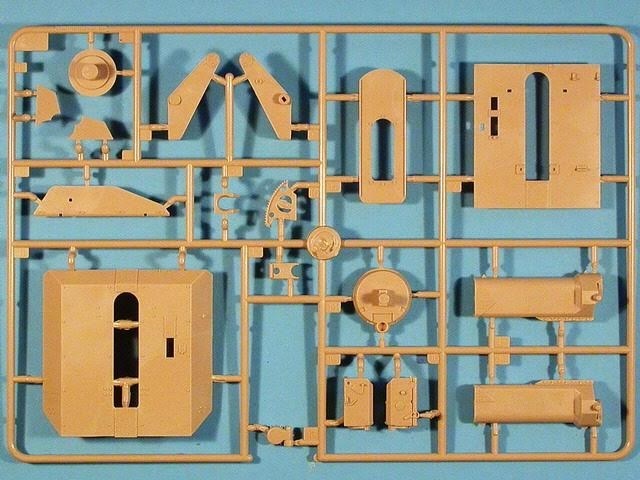 One side panel of the box has a one-paragraph history of the PAK43 in English and Chinese, followed by illustrations of the 3 brass PE frets, the plastic ammo rounds, a copper tube and the turned-aluminum gun barrel in the kit. The copyright of the kit is given as 2010. Trumpeter’s street address in Macau, China and their web address is supplied here. The other side panel has 2 small color side views of the PAK43 showing it in firing mode and towing transportation mode, followed by the statement that the product is not a toy and not for infants. 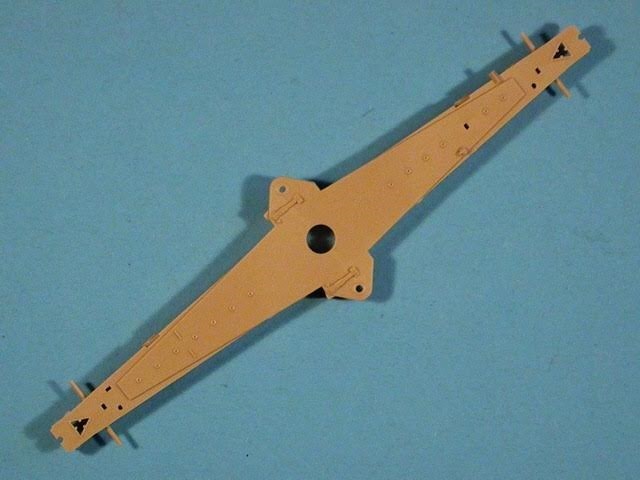 It is designed for modelers over 14 years of age. The kit was made in China. 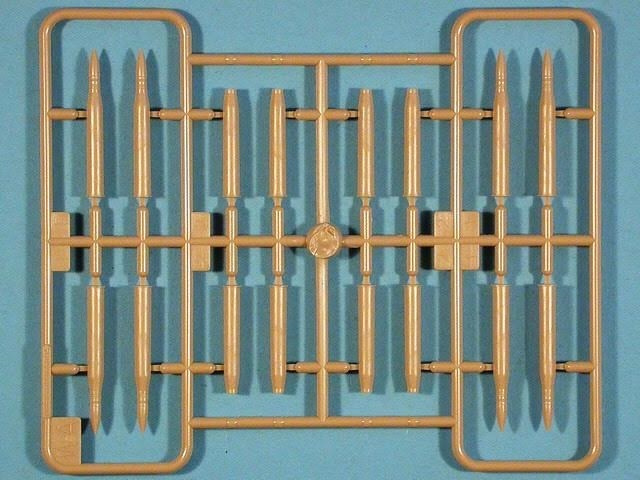 This kit contains 7 light tan trees of parts, a loose tan ground support beam, 3 frets of brass PE, a copper tube, a turned aluminum barrel and 8 black vinyl tires. All nicely in cello bags. There is no decal sheet in the box, as these cannons usually were unmarked. There is no gun crew included either. The instructions and a sheet of painting instructions completes the kit’s contents. The instructions consist of a staple-bound booklet of 12 pages in 7 ¾” x 10 ½” page format. Page 1 begins with a black and white side view illustration of the PAK43 in the transportation mode. This is followed by READ BEFORE ASSEMBLY intructions in English and Chinese, international assembly symbol explanations and decal application instructions in the two languages. The decal instructions are redundant, because there are NO decals in this kit. Page 2 has the parts trees illustrations. Pages 3 through 17 give a grand total of 17 assembly steps. In step 10 you opt for either the plastic gun barrel (which comes in halves) or the turned aluminum one with the copper tube. You also opt here for either the plastic gun shield or the PE one. 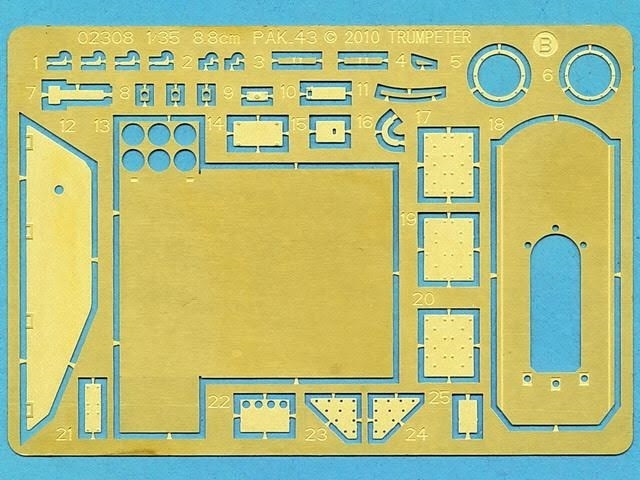 I opted for the plastic one because the large PE shield sections were missing in my kit. Also, to do the PE one you have to add a whole bunch of plastic rivets to holes that are in it. 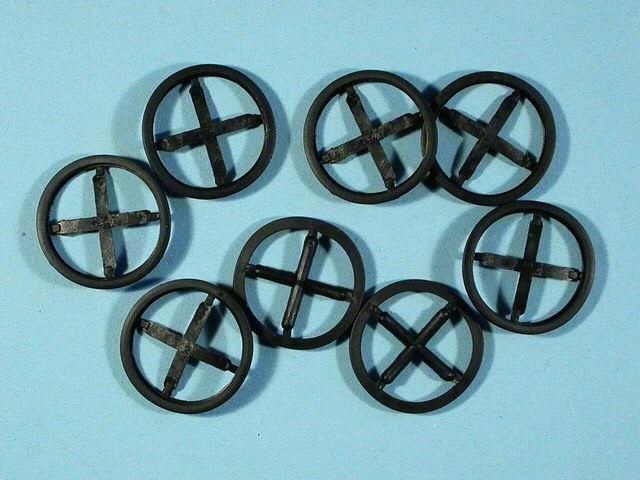 These rivets are literally the size of a period in a sentence and would have been a real chore to assemble. 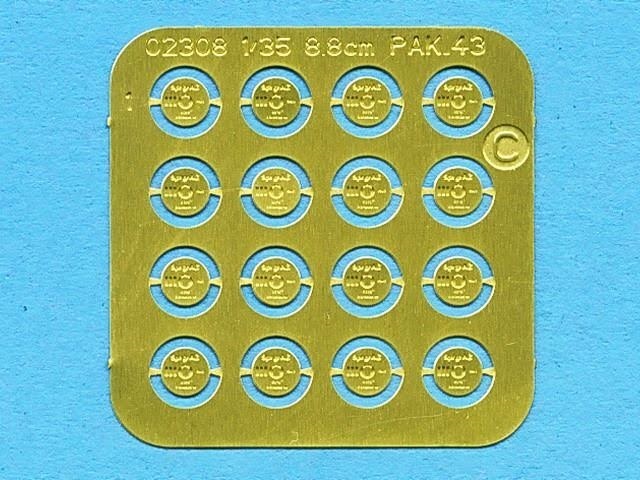 The plastic shield has these rivets molded on. In step 3 you decide if you want to finish your PAK43 set up for firing or in the transportation mode on the front and rear wheeled carraiges. I am going to do mine in the transportation mode. There are ground stakes to put into each of the 4 arms of the support base if you opt to have it in firing mode. 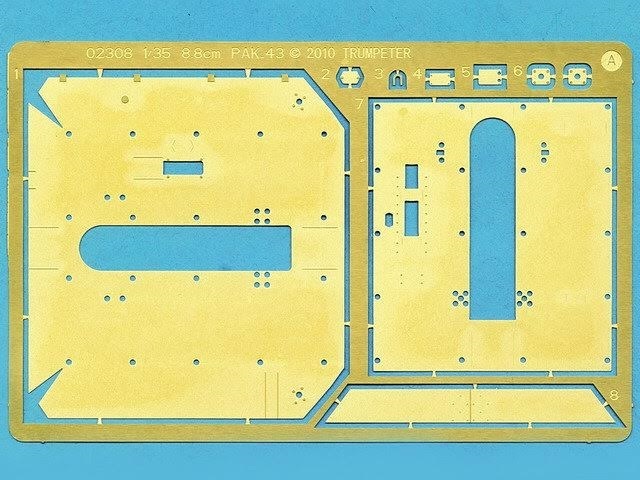 The single sheet in the kit is printed on slick coated stock of the same page format as the instructions. 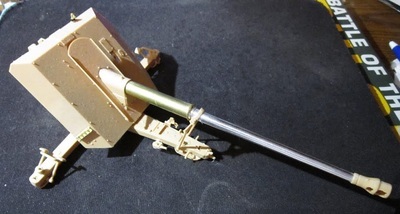 It has a full color 5-view of the PAK43 on each side. On one side is illustrations of the PAK43 in the transportation mode, showing sides, top, front and rear views. It is overall sandy brown with no markings, even though the page says it is PAINTING AND MARKING GUIDE. 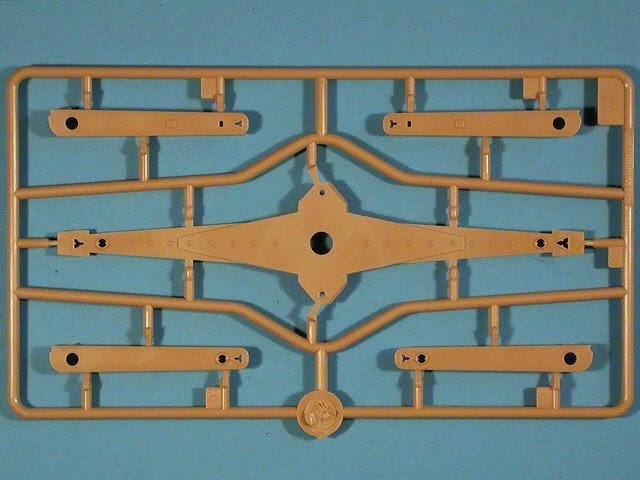 Two colors: sandy brown and black are called out in Mr. Hobby, Vallejo, Model Master, Tamiya and Humbol brands of hobby paints. I don’t know why you are told to paint the tires black when they are already molded in black vinyl to begin with. 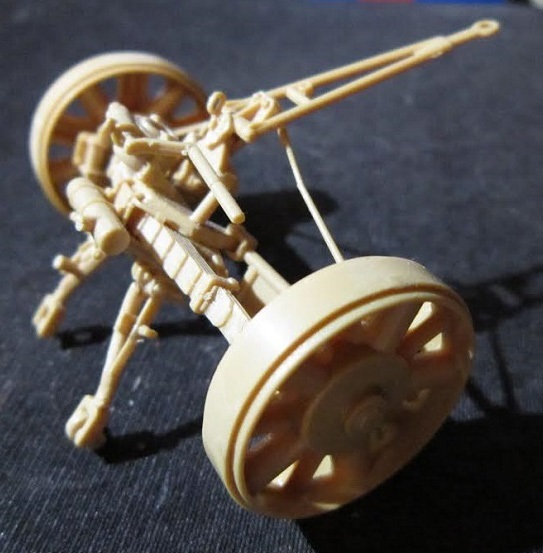 The other side has a color 5-view of the PAK43 again, but this time in the firing mode. While building my kit I managed to lose several small parts and wound up scratch-building their replacements. 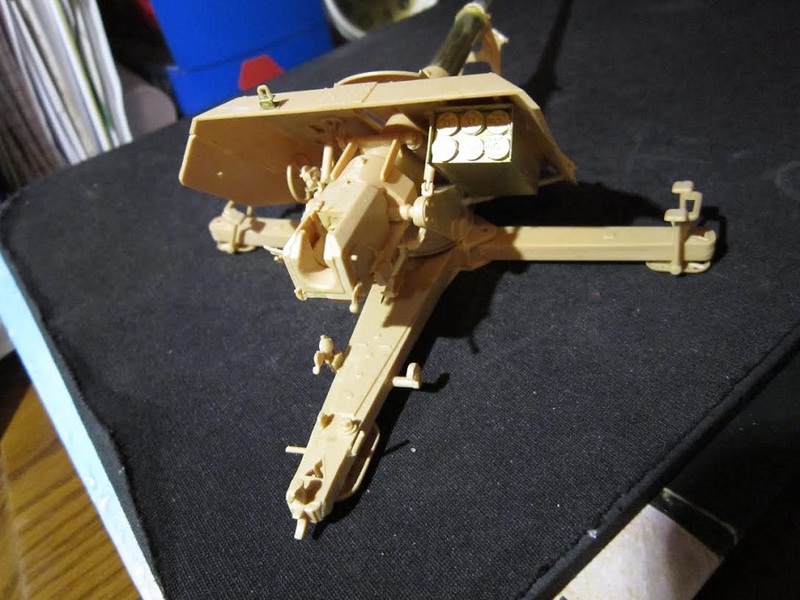 Building proceeded nicely through the steps, but a lot of caution should be used so as not to get things assemble wrong with some very miniature sized parts. 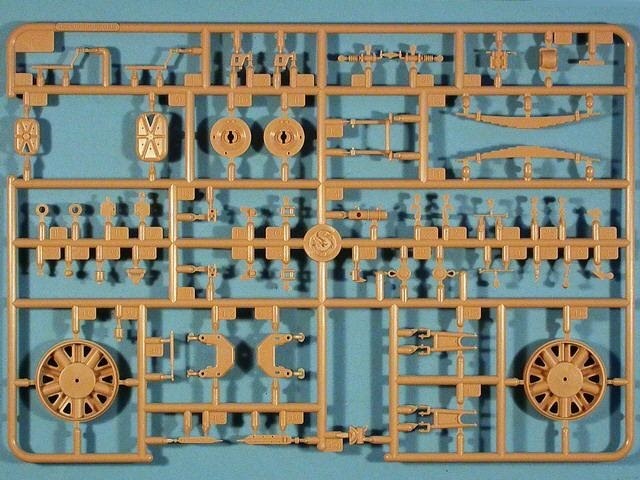 As an example, each wheeled carriage consists of 45 parts each. Anything that can be a separate part, definitely “IS” in this kit, almost to the extreme. However, this means very exceptional detail. The loose single top half of the bottom main base support bream is labeled as A4. 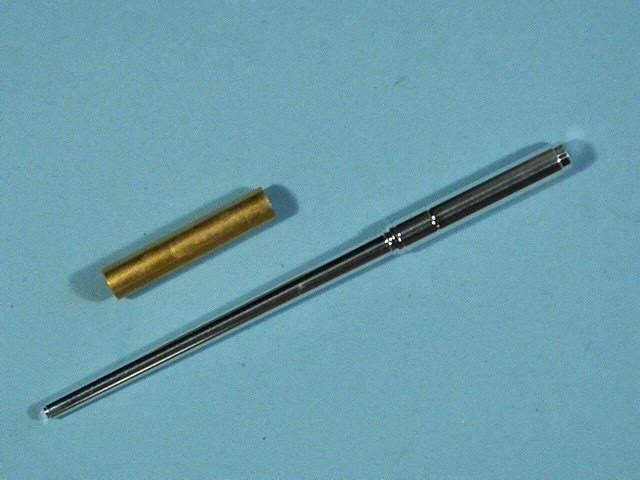 The copper tube that goes on the back end of the gun barrel and the turned aluminum gun barrel are next. Final parts are the 8 black vinyl tires. 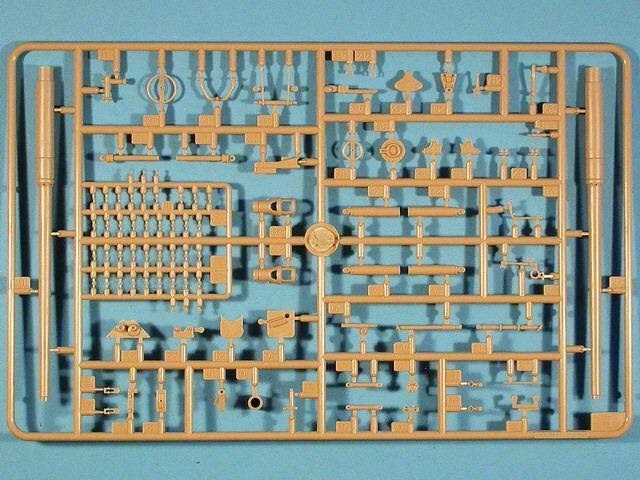 This kit is not for the novice modeler and is not a weekend project by any means. 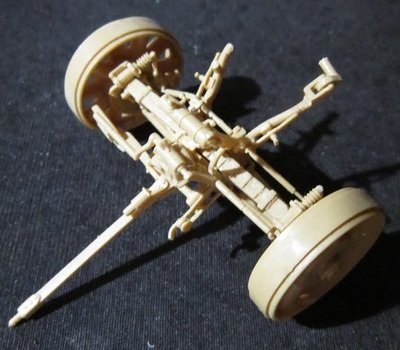 I recommend it only to advanced modelers who have other kits that they have built that have extensive amounts of small parts under their belts.